Alex has outgrown his newborn size onsies. He can still wear his newborn size pants since he has a long torso and shorter legs. 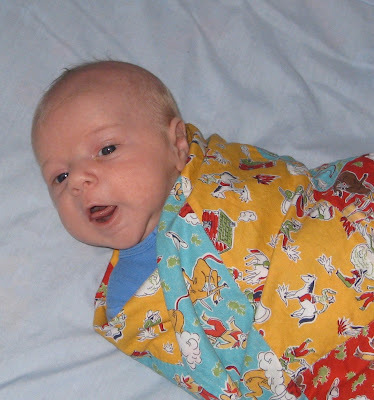 He won't go naked though, we have been fortunate to receive clothes as gifts and some cute hand-me-downs. Two packages came this week addressed to Alex. I opened the first one and got a chuckle from seeing a stuffed Brutus Buckeye. Uncle Brendan is on a mission to try to keep Alex from being a Longhorns fan. We'll see who Alex roots for when he is older. 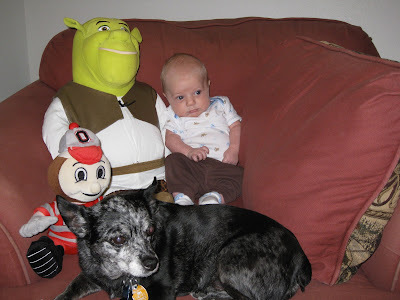 Then I opened the second one and got a good laugh out of seeing a large, stuffed Shrek from his "Uncle Shrek." Yesterday we had a chance to take a few photos. 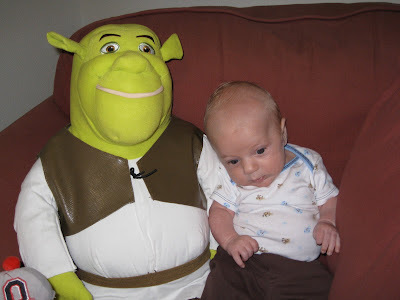 Yes, the stuffed Shrek is larger than Alex. At some point, Frida decided to jump into the photo since we were using her chair. Alex continues to grow and fill out. Our home scale has him weighing almost 11 pounds. We will get a better number when he goes to the doctor on May 4th. 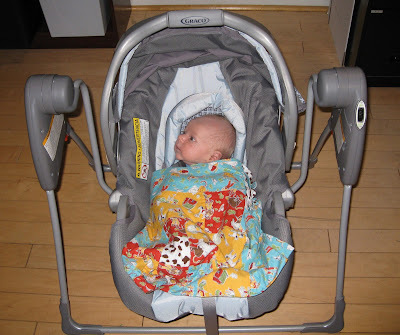 I have hung some toys from the bar on his pack n' play and he now has an activity gym. He likes to look at the toys and bat at them. He also kicks his legs a lot. He has started making some vocalizations that are not crying. I am thinking that this is the beginning of cooing. Yesterday we were able to get a picture of Alex smiling. I love seeing him smile. When I am tired, one of his smiles makes it all worth it. It looks like Alex's eyelashes are getting darker and he has some darker hair coming in now. He is giving us more smiles. We still are not sure if he looks more like John or me. Maybe he just looks like "Alex." 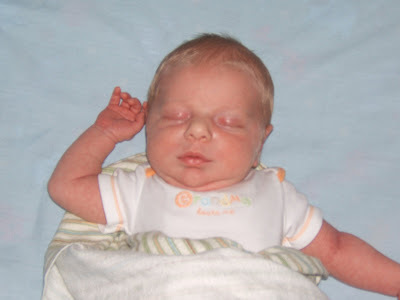 Some of Alex's blond hair has fallen out since birth, and he now has what I refer to as a "baby receding hairline". He still has a good amount of hair though. He started giving us "social smiles" on Tuesday. He smiled not too long after birth, but it was not intentional. 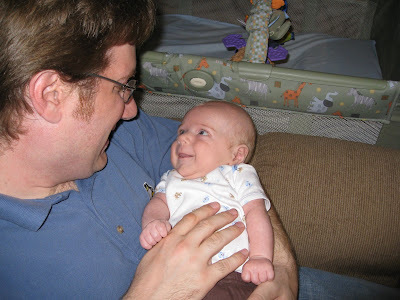 Now it appears that John and I have received some intentional smiles, especially around feeding time. It may be a while before I can catch one for a picture. Alex is 6 weeks old today. A few days ago, he hit his 6 week growth spurt and has been eating like crazy. John started calling him Mr. Wiggles since he moves around so much. Swaddling does help him sleep, but once he is awake he can no longer be contained. He can wiggle out of a blanket in no time. The six week mark also means that my maternity leave is now half over. I am fortunate to have this time with Alex, but I have realized that being home with a child (or children) is a lot of work. Your days are not very predictable and no one schedules a luch hour for you. I am amazed at how fast the days go by even though we spend most of it at home. Alex spent his first Easter with us at Misty and Savannah's house. We had a nice lunch and some time to catch up. 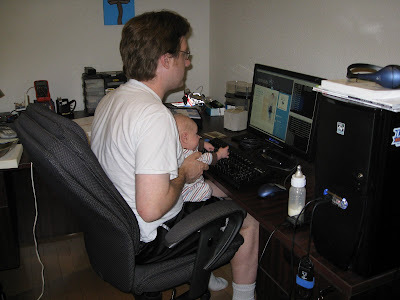 Alex is such a good baby and slept while we did our taxes. He went on his first outing to a restaurant today. We did not stray to far from home and went to the Subway that opened recently at the end of our street. Alex is pictured looking at his Daddy from his swing. 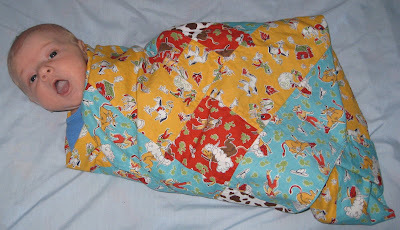 The quilt was made by his great-aunt Cindy Grafton. I get some time to scrapbook/stamp, and John gets some time to play softball. John's co-worker, Jamie, took some good pictures of John at their game on Friday night. Once Alex gets older, he can go watch his Daddy play softball. When you copy an idea from someone in scrapbooking, it is called "scraplifting". When you copy an idea from someone in stamping, is it called "stamplifting"? I made this card to send to a friend for her birthday. (Happy Birthday Wendy!) It is probably still in the mail. 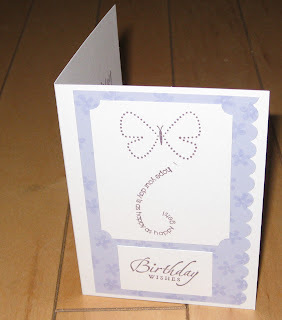 I used a card made by my Stamp Club leader, Tiffany, as inspiration for this card. (Click here to view her card.) It was nice to get to scrap and stamp last Sunday with Kat and Sharis. Alex keeps us busy, but John and I are making a little time for our hobbies. John took this picture last night because it looks like Alex's teddy bear is trying to attack. 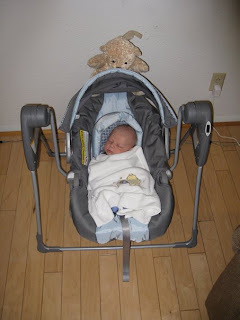 Actually, Alex really likes his swing and "womb" bear. The bear can be attached by velcro and makes the sounds that babies hear in the womb. These items really help him sleep.